Caitlin is one of my wonderful patients who I met around 9 months ago. 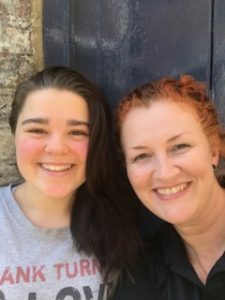 Her mum brought Caitlin, who was then 14, for craniosacral therapy, in the hope of helping some severe tics, tremors and seizures which were having a huge impact on her life. I’ll let her mum and Caitlin share their story. I’m so pleased to know them, and proud that they’re sharing their story with you. Enjoy. On Christmas Day 2017, my 14yo daughter started having violent seizures, sometimes 8-10 per day. These seizures would leave her completely incapacitated; unable to control the movement in her limbs, sometimes lasting a number of hours. She’d had what had been diagnosed previously as motor tics during periods of extreme stress, but this was on another scale entirely. On 28th December, she was admitted to hospital following another day peppered with seizures, and again, we were told it was motor tics related to stress and she should just needed to relax. We’d been to the GP earlier on the same day, who had referred us to a neurologist for an assessment. We waited a couple of weeks for the neurology appointment, and as the 14yo is home educated, we were able to manage her seizures at home whilst we waited to be seen. We met with the neurologist who diagnosed “Non-Epileptic Attack Disorder”, where the brain responds to extreme stress by misfiring its messages and causing the body to exhibit extreme, uncontrollable movements. The neurologist was confident that we could manage this with some stress management, and so we took to the internet (and our close friends!) for information and advice around what we could do next. 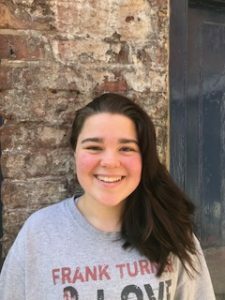 By this time, the 14yo wasn’t able to attend her performing arts classes, nor take part in much education and we knew we needed to put some things in place that were more than just reassurance during a seizure. One of our closest friends had recently had a bout of vertigo, which she was managing through craniosacral therapy – something I’d dismissed as quackery but with little comment – whatever works for you, I thought. She also lives in London; easier to find something more alternative in a city of 8 million people, rather than County Durham, where we live! We became a little desperate – the 14yo’s life was completely on hold. She’d gone from using public transport every day and socializing with her friends, attending classes and rarely being home to a young woman whose confidence was battered; she couldn’t get the bus for fear of a seizure, she couldn’t participate in her performing arts classes; she couldn’t hold a fork due to the tremors in her hands and when she could hold a fork, she’d miss her mouth with food due to the severe tremors in her head and neck. 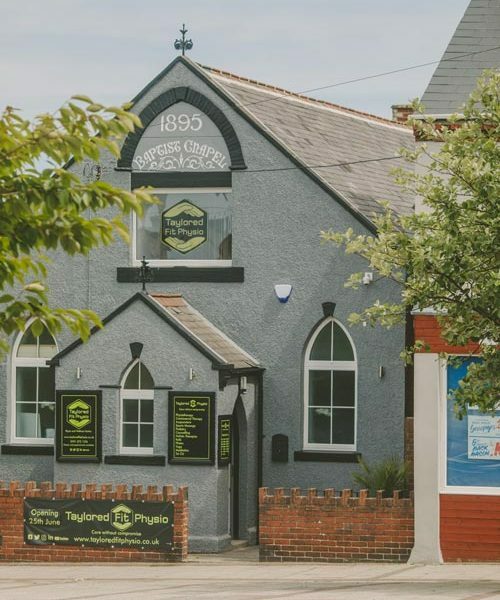 Eventually, our lovely London friend talked us into finding a craniosacral therapist, and we started with a quick facebook search and stumbled upon Tayloredfit Physio – which certainly shows the power of social media for small businesses! I had a brief chat with Vicky, who was extremely relaxed and made me feel reassured that she wasn’t going to be fazed by 14yo’s constant body movements and that an assessment would help her to see what treatment might be best. We met with Vicky for an initial appointment, and she didn’t bat an eyelid at the head tremors and movements that 14yo’s body sporadically made. She had an initial treatment and we came home, expecting only for 14yo to feel more relaxed. Following the first treatment at the end of January 2018, 14yo managed to sleep through the night for the first time since Christmas Day. She was still having seizures, but they were much less violent in nature and although her head tremor was present all of the time, she’d started to become much less self-conscious and even managed an evening out with her friends. During the first week of February, she managed a whole day without a seizure – something that we’d been worried would never happen! Since February, 14yo has had a treatment around once per fortnight. Her seizures have settled down considerably and the head tremor has gone completely. She now doesn’t have seizures at home, and the only time she does have them, it’s due to a stressful environment (a high intensity exercise class or a nerve-wracking rehearsal for example). 14yo is now 15yo and is managing to manage her seizures by making sure she is eating and drinking regularly, listening to her body, taking time to rest and relax and trying not to overwhelm her brain with panicked thoughts. She’ll continue her treatments until we have the seizures completely under control or until she can recognize her early warning signs and prevent them before they start. This has become a bit of a long winded piece, but I think it’s important to consider how alternative therapies can help you to recover from something that, at one point, we feared she’d be stuck with forever. We now feel confident that the treatment helps 15yo to relax, and relaxation is important if you have a brain that doesn’t always behave itself! Thanks to Vicky for being approachable, supportive and confident that we could manage these things and for talking us through options for things we can do at home, such as mindfulness and other relaxation techniques. We’re delighted to have used her services and highly recommend her – even if, like me, you might feel a bit skeptical about alternative therapies. I started having seizures in December. We didn’t know what caused them or why they happened. I went to the doctors and my GP didn’t know what they were. I was having up to 10 seizures a day with permanent neck movements. My seizures could last hours and they would happen in my sleep. I started to get really fed up and wanted to find a solution or at least something that made them bearable. We found Tayloredfit through Facebook and I had my first assessment/treatment in January. I was nervous at first, I didn’t like meeting new people because of the way I looked with my neck movements but Vicky wasn’t fazed. I began having regular treatments with Vicky and I started to get better! My neck movements eventually stopped and I now have roughly 2-3 seizures a week. I don’t think I would have benefited from the treatment as much as I have if it wasn’t for Vicky. She was so lovely, welcoming and very down to earth. When I go in for a treatment we just chat, it’s a really nice environment. She is interested in what I do and really listens to me. If you’re looking for someone who is warm, considerate and can talk you through a tailored treatment programme, start a conversation with Vicky! Thank you so much for your positive story Caitlin and Jo, I’m so pleased things have improved! 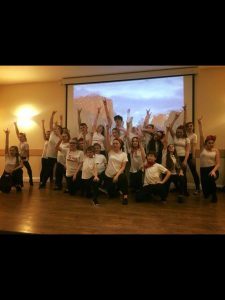 Can’t wait to see Caitlin perform with her musical theatre group this weekend, she will no doubt be amazing! Thank you so much for your lovely comments Pam, Caitlin and her family are amazing, and it is definitely generating some interest! Thanks again.